Greg and Teresa Watson are both natives of North Carolina; Greg from Lenoir, Teresa from Hendersonville. They reside in Balsam Grove, NC. Greg grew up in a very musical family, and began playing the guitar and do bro at an early age. His first recording was made at the age of 17. He had a nationwide release in 1991. He recorded two sides for an independent Record Label in Nashville, TN. Even though the sides were not released he was offered a Country Music recording contract, but declined. While still in Country music he met, and later married Teresa McCall. Teresa is a graduate of UNC-Chapel Hill with a B.A. Degree in Recreation Administration, and is a singer, songwriter, and musician. She plays Electric Bass, Guitar, and Mandolin, and sings both Lead and Back-up vocals. She has written several songs, one of which went to number 8 on the Gospel Music charts, and has performed in several groups. Her first recording was made in 1986. 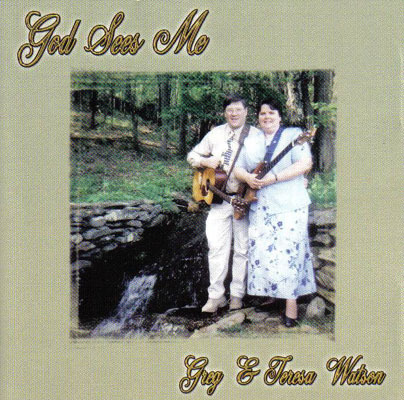 Greg and Teresa were married in 1993, and recorded together for the first time later that year. In 1994 Teresa was diagnosed with Multiple Sclerosis, and was told by several doctors she should be bed-ridden. However, through her faith in God, and willingness to serve Him, she remains able to work for Him - not from a wheelchair but on her feet! They have performed professionally in Nashville, TN. They have visited Meridian, MS, where Greg was allowed to record with Jimmie Rodgers' original 000-45 Martin guitar. This marked the first time the guitar was recorded with since the late Ernest Tubb did so in the 1940's. One cut with the guitar "I Claim the Victory" is included on their release "Don't Go Home Unsaved." This release also contains the last released recording of the late "Bashful Brother Oswald" playing the do bro on "The Great Speckled Bird." Since March 2000 they have gone to a "full-time/faith based" Ministry and are traveling and performing on a regular basis. They were inducted into the Country Gospel Music Association in 2001. In August of 2004 & 2005, they were voted Eastern Division Bluegrass Artist for the CGMA. They then traveled to Branson, Missouri in October for the CGMA 50th Anniversary Convention where they were voted the 2004 & 2005 International Bluegrass Artist of the Year. Wow! This was a totally unexpected happening for them and it left both of them kind of speechless and tearful.